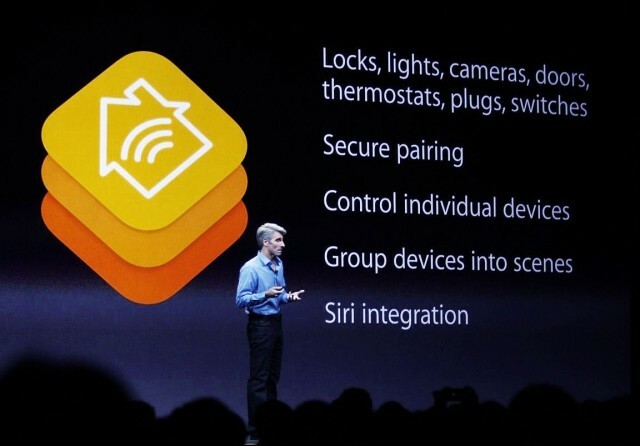 Craig Federighi talks up Apple’s home automation plans. “Apple is creating a tighter and tighter cross-device ecosystem between computer, phone, TV, tablet, and ‘the internet of things,’” Aaron Watkins, CEO of app marketing company Appency, told Cult of Mac. The rapidly expanding home-automation business is expected to hit $48 billion by 2018, according to a recent estimate. HomeKit is Apple’s bold bid to place itself at the center of that market by changing the way we interact with all smart devices, from security cameras to refrigerators. Currently, if you have connected lights from Philips, a thermostat from Honeywell and a SmartKey from Kwikset, they all require their own apps and protocols. You cannot turn down your lights and turn up the heat with just one app. HomeKit will change that. Apple is already working with leading makers of home-automation devices — including the companies mentioned above — to develop a centralized platform for home automation. HomeKit brings the same protocols and security measures to all your connected devices and allows you to control them all with just one app. And it won’t simply mimic the way traditional remote controls work: HomeKit will work alongside Siri to give iOS users the opportunity to control connected devices using voice commands. Moreover, HomeKit will allow grouping of devices, allowing us to control multiple things at the same time. When you arrive home from work, for instance, you could tell your iPhone “I’m home” and HomeKit could automatically open your garage door, unlock your front door and turn on your living room lights. A “get ready for bed” command could lock the doors, turn down the thermostat and activate your alarm. Making home automation easier could help boost the adoption of connected devices — at least that’s what some hardware providers are hoping for. Others see HomeKit as an opportunity to take home automation further and introduce new technologies that may not have been possible without such as platform. While HomeKit is Apple’s first foray into home automation, it isn’t an attempt to compete with Google and Samsung for a share of the home-automation hardware market. That could happen in the future, but right now, it’s all about improving the experience for those with existing devices.